Kick off your visit on the 7th (Wed): indulge your thirst for a good beer at De Halve Maan Brewery, contemplate the long history of Historic Centre of Brugge, then take in panoramic vistas at Belfry of Bruges, and finally make a trip to The Markt. 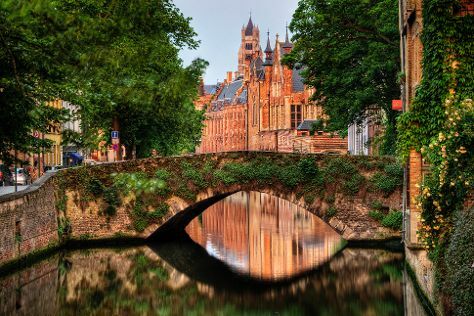 To find photos, traveler tips, where to stay, and more tourist information, you can read our Bruges trip itinerary maker site . Sao Paulo, Brazil to Bruges is an approximately 18-hour combination of bus, flight, and train. You can also do a combination of bus, flight, and train. You'll lose 4 hours traveling from Sao Paulo to Bruges due to the time zone difference. In August, daily temperatures in Bruges can reach 25°C, while at night they dip to 15°C. Cap off your sightseeing on the 7th (Wed) early enough to go by car to Amsterdam. On the 8th (Thu), admire the masterpieces at Rijksmuseum, then explore the world behind art at Van Gogh Museum, and then tour the pleasant surroundings at Vondelpark. For more things to do, photos, maps, and more tourist information, use the Amsterdam driving holiday site . Traveling by car from Bruges to Amsterdam takes 3 hours. Alternatively, you can take a train; or do a combination of train and flight. Expect a daytime high around 26°C in August, and nighttime lows around 15°C. Wrap up your sightseeing by early afternoon on the 9th (Fri) to allow enough time to travel back home.